Used for cooking on a large scale, stock pot supplied by us is a wide pot with a flat bottom, straight sides, a wide opening to the full diameter of the pot, two handles on the sides, and a lid with a handle on top. We also deal in hotel equipments, restaurant supplies, catering equipment, food warmers, commercial food warmer, steel food warmer, bakery equipment, food equipments, industrial containers, packing containers, stainless steel canisters, canisters, sugar canister, stainless steel canister set, food storage boxes. 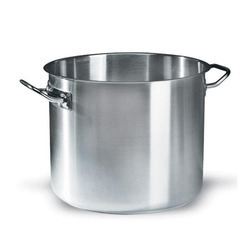 Stainless Steel Stock Pots are built for delivering heavy-duty service. This also makes them most durable line of food service cookware. Further each piece is constructed using heavyweight stainless steel and features capped encapsulated aluminum slab bottom that allows quick as well as even heating. Looking for Stock Pots ?